ADAFRUIT-INSPIRED DESIGN BLOCKS COME TO AUTODESK EAGLE @ADSKEAGLE @adafruit « Adafruit Industries – Makers, hackers, artists, designers and engineers! Hey folks, this is news! NEW YORK — May 22, 2017 — Adafruit Industries and Autodesk EAGLE are teaming up to encourage aspiring engineers to learn about electronics and computer programming with a new open-source design technology. The two companies are teaming up to offer Adafruit’s most popular open-source designs as reusable design block modules in Autodesk EAGLE, the PCB design tool made for every engineer. 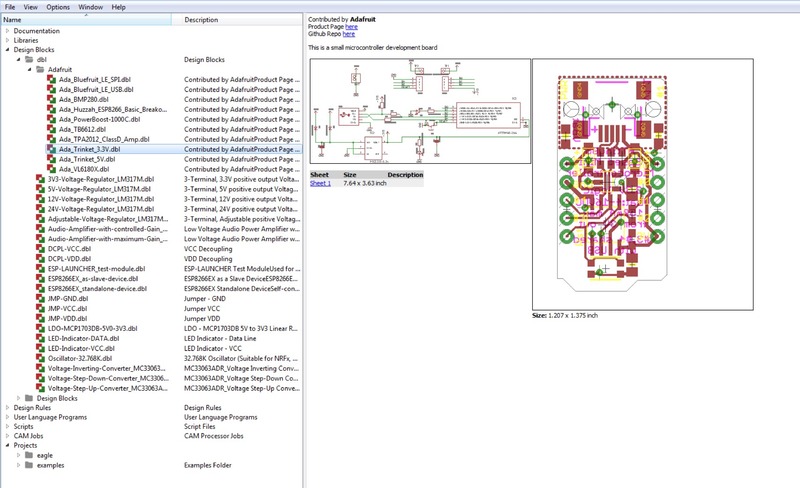 These design block modules allow engineers of any skill level to easily incorporate existing circuitry and technologies into their own schematics and PCB layouts without having to start from scratch. All of Adafruit’s most popular designs will be included in the new Design Blocks area in Autodesk EAGLE, and will provide engineers with the confidence they need to build on proven technology. This is just the beginning of an effort to take collaborative and open-source engineering to the next level by encouraging the EAGLE community to share design blocks freely, the same way they do with libraries, projects, and User Language Programs (ULPs). Expect to see plenty of tutorials, blogs, videos and more from Autodesk EAGLE about this exciting technology soon! “Makers around the world looking to learn about the open-source designs from Adafruit now have a great way to get started quickly and easily with the new Adafruit-inspired EAGLE design blocks” – Limor “ladyada” Fried, founder & engineer, Adafruit Industries. To learn more, please visit: autodesk.com/company or follow @autodesk on Twitter, Instagram, and Autodesk on Facebook. Adafruit was founded in 2005 by MIT hacker & engineer, Limor “Ladyada” Fried. Her goal was to create the best place online for learning electronics and making the best designed products for makers of all ages and skill levels. Adafruit has grown to over 100+ employees in the heart of NYC with a 50,000+ sq ft. factory. Adafruit has expanded offerings to include tools, equipment and electronics that Limor personally selects, tests and approves before going in to the Adafruit store. Limor was the first female engineer on the cover of WIRED magazine, awarded Entrepreneur magazine’s Entrepreneur of the year, and was on the cover of Make: Vol. 57. Ladyada was a founding member of the NYC Industrial Business Advisory Council. Adafruit is ranked #11 in the top 20 USA manufacturing companies and #1 in New York City by Inc. 5000 “fastest growing private companies”. Adafruit is featured in Google’s Economic Impact Report. Limor was named a WHITEHOUSE CHAMPION OF CHANGE in 2016. Adafruit is a 100% woman owned company. For press inquires, click here. Thank you EAGLE folks for making this happen!